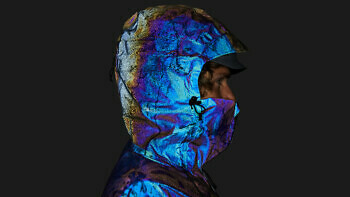 The Black Squid Jacket is a fully waterproof and windproof outer shell that mimics one of nature’s most mesmerising innovations – the adaptive camouflage of the squid. Over the last 500 million years they’ve evolved the ability to change their colour and appearance at high speed and with almost infinite variety to hide, attack, or communicate. We’ve replicated elements of this biological survival mechanism using lasers, resin and over 2 billion disruptively-structured microscopic glass spheres. 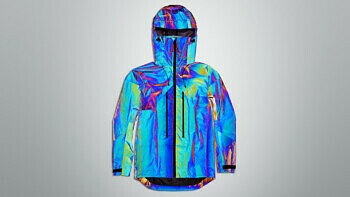 The result is a mind-bending ski and snowboard jacket. While it looks like metal or oil in dull light conditions, when exposed to bright light it instantly reflects every colour in the visible spectrum. This alien-like power is useful whether you want to be seen on the ski slopes or you’re a 20cm sea creature trying to avoid becoming someone’s dinner. Sign up to get advance access to the next edition of the Black Squid Jacket and other new releases. The Black Squid Jacket has a slightly oversized fit as it’s cut for extreme movement. If you like your jackets to have a closer fit, we recommend buying a size down – or you can chat to us about what size will work best for you. We shot the Black Squid Jacket on climber, snowboarder and surfer James Jagger, who is 6ft 1 / 185cm and wearing size medium. And don’t worry if you order something and it doesn’t fit – we have a free, no hassle 30 day return and exchange period. Back in 2017 we started on our journey towards building clothing that could mimic the astonishing colour-shifting survival mechanisms found in the animal kingdom. Our Blue Morpho Jacket recreated one of nature’s most brilliant solutions to high visibility – the iridescent wings of the Blue Morpho butterfly. 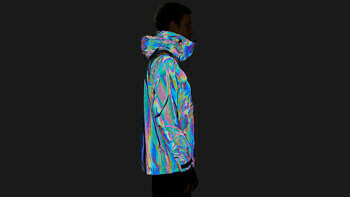 And the surface of our Solar Charged Jacket can be charged by the sun to glow in the dark like a firefly. While we know we’ll always be playing catch up with nature, our ultimate aim is to create synthetic materials as smart and responsive as the biological ones mastered millions of years ago. 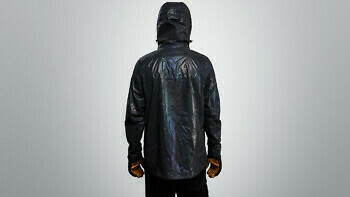 The Black Squid Jacket is the next step in our journey. Based on 500 million years of evolution in the deep sea, this colour-shifting jacket mimics one of the most advanced biological materials on earth: squid skin. A complex network of nerves on the surface of every squid acts like an electrical skin to help it change colour and appearance at high speed. It can make itself highly visible by creating astonishing optical illusions in fractions of a second. Or make itself practically invisible by camouflaging to precisely match its surroundings. Because of its transformational properties, squid skin is currently the subject of serious scientific study. The goal is to create an equivalent synthetic material that can rapidly camouflage itself by mimicking its surrounding environment. And with the military looking for solutions that would enable soldiers and machines to seemingly disappear, it’s only a matter of time before it becomes reality. The challenge is what timescale that’s on. While nature solved the problem of adaptive camouflage over millions of years, scientists only started trying to replicate these biological systems in the last decade. This first iteration of the Black Squid Jacket focuses instead on replicating the elements of squid skin that make it hyper-visible. Because the same nerve network in the squid’s skin that allows it to change its colour and markings also lets it appear to be emitting stunningly bright light. With a special layer of cells in its skin acting like a mirror, it can turn iridescent and radiantly bright by reflecting and scattering all visible light, creating mesmerising patterns across its skin. While most colours we see are caused by pigments absorbing and reflecting certain wavelengths of light, iridescence is caused by structures on the surface of the object interfering with how the light is reflected off it. The interference means that light isn’t simply reflected but scattered. The result is that iridescent colour appears different whatever angle you look at it from. It isn’t constant, and it can’t be. So squid skin can appear to be every possible colour at once, and different from every angle. While the squid uses microscopic plate-like structures on the surface of its skin to change colour, our jacket uses disruptively-structured microscopic glass spheres. With over two billion of them embedded in resin on the jacket’s surface, and over 40,000 in every single square centimetre, they’re invisible to the naked eye. When light hits the jacket, it travels through the curved surface of these black glass spheres and strikes the back of them, before being reflected back at the original light source and scattered away from it simultaneously, so that the fabric looks like it’s emitting light. 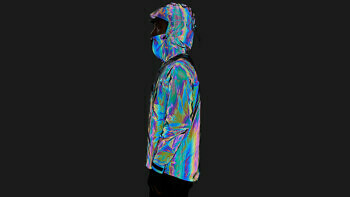 As the jacket develops colour through structural colouration, it acts like a mirror for whatever light conditions you expose it to. 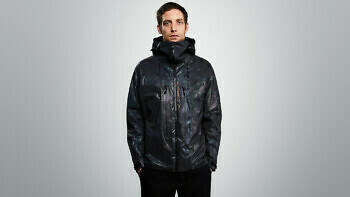 When you’re inside or in subdued light conditions during the day, the jacket is a dull metallic black. 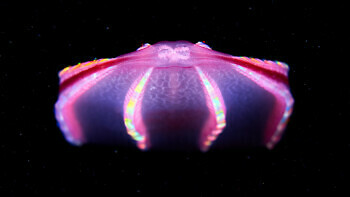 As you move around, you’ll see flashes of colour in the surface just like you’d find in a pool of oil or sheet of metal. When exposed to bright light the jacket instantly reflects every colour in the visible spectrum, creating pools of vivid colour that make it look liquid. If you’re out on the slopes in the sun, as colour shifts rapidly across the jacket the entire surface appears to warp, creating patterns that mess with your head. 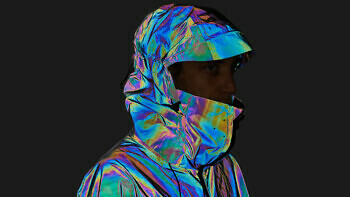 So if you’re trying to be seen on the mountain rather than avoiding detection on the battlefield, then this is your jacket. Shooting the jacket with your flash on during the day makes it look like it’s been made in CGI, and it works whether you’re shooting photos or video. This film was shot on an iPhone in low light and uses zero special effects other than turning the flash on. The end result is so otherworldly because of how close the flash and lens are. As the jacket reflects light straight back at the flash, it also directly strikes the lens – making the jacket look like it’s emitting light. 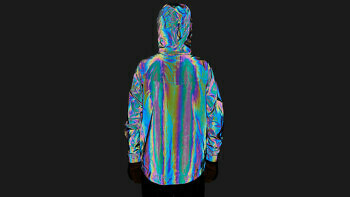 At the same time the surface of the jacket scatters the rest of the light to give it its mind-bending colour. When the jacket is exposed to a camera flash, headlamp or searchlight at night you get the full bionic effect as your face and body seem to disappear and only the jacket remains. 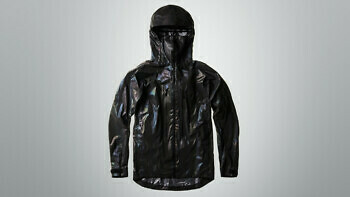 So this is what your jacket would look like under a headlamp or helicopter searchlight out on a mountain at night. The black dots and streaks are water droplets which temporarily prevent the glass beads reflecting light back at the camera. 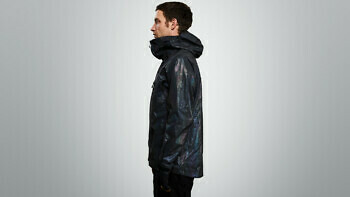 Just like squid skin itself the Black Squid Jacket can appear to be every possible colour all at once. And because of the way the disruptively-structured microscopic glass spheres on the surface of the jacket scatter light, two people can be looking at the jacket from two different angles and will see entirely different patterns and colours. Even if you’re holding a camera up to the jacket, what you see through the lens and what you see in real life, will be two different images. 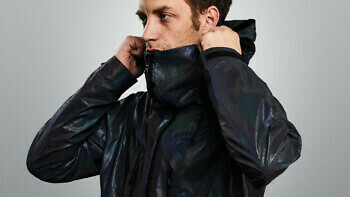 The Black Squid Jacket is a fully waterproof and windproof uninsulated outer shell. We designed it to work with any gear from our layering systems worn underneath it for warmth – either our Condition Black layering system made with ceramics, or our Planet Earth layering system made with Merino. If you do need to dump heat out of the jacket you’ll find two waterproofed pit zips with two-way zippers that can be operated with one hand. We cut our gear for extreme movement. So as an outer shell for the mountains we’ve made the Black Squid Jacket slightly oversized, which means on the coldest days you’ll be able to layer up as much as you want beneath it. If you like your jackets to have a closer fit, you can of course drop down a size, or chat to us first about what size will work best for you. The heavy-duty front zipper is waterproof, backed with an internal storm flap and has rubberised zip pulls. We built two large waterproof front pockets big enough for any maps and gloves either side of the zipper so they’re fully usable while wearing a backpack. And there’s a large internal zipped pocket with headphone loops for your phone. 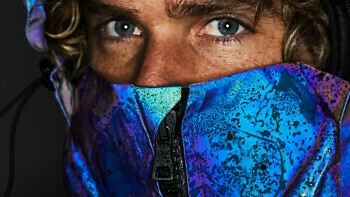 The jacket’s super high collar is designed to ride comfortably up and over your face to meet your goggles. The collar and hood are engineered like an ocean-racing marine jacket, which means they’re designed to operate independently. So if you want to ride with your face covered but your hood down, you can. The elasticated hood works with any ski and snowboard helmet and has drawcord adjusters at the side and back. The collar is lined with merino next to your mouth and nose, and comes with six air vents. Every element of our Black Squid Jacket is engineered with precision. As nothing sticks to the glass material we etched out the logo on the hood with lasers by removing a microscopically thin layer from its surface. The material is highly experimental so small blemishes and marks will appear on the surface of the jacket over time, both during the production process and once it’s being worn, which means no two jackets will ever look quite the same. You’ll find bellowed grooves cut into the cuffs of both wrists. So if you’re putting on large gloves you can unfasten the Velcro at the wrist which allows the cuff to open up in size. 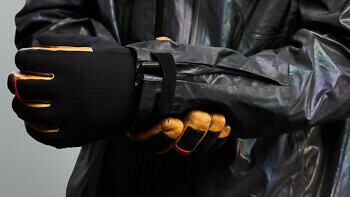 Then once your gloves are on you can strap the wrist back up to keep the powder or rain out. All our Velcro adjusters are super adhesive.